The lesson is this: start with them. Before you finish your yawn and click away to something else, consider this is so easy to say, and yet not so easy to do. Sometimes it’s simply hard to remember to do it. When a client requests basic info about what you do. I get a lot of inquiries about our work, and I conduct a lot of introductory calls, which are usually followed by an email with more detailed information. I’m a little embarrassed to admit, hundreds of emails later, that it still takes some effort for me to remember to start the email with a recap of whatever I know about them, before I launch into “the usual” about us. And when I remember, it takes effort to take the time to do it. When you’re writing a proposal. My aforementioned colleague realized that their proposal doc included way too many pages up front about their firm before getting into anything about the client. Lest you think this is only their problem, do a random sampling of your most recent proposals. I’ll bet you’ll find a similar issue. When you’re drafting agreements/work statements/memos of understanding. I have a pretty basic template that I like to use for our agreements, when our clients’ legal teams permit it. It’s simple and straightforward. The very first section is a brief summary of what’s important to them and why they want to do this work. (Thank goodness for the template, which helps me be accountable for doing this part.) I never thought of this as terribly distinctive until a few months ago when a new client went out of his way to comment that he’d never seen this before in all the agreements he had signed—in fact, he was so struck by it, he made mention of it to his boss. Then came the general reminder from my long-time consulting colleague. I’d say, “You don’t have to tell me twice,” but I guess, in fact, you do. If you’ve gotten this far, you’ll likely agree that this Weekly Tip isn’t up for the Most Inspiring award. 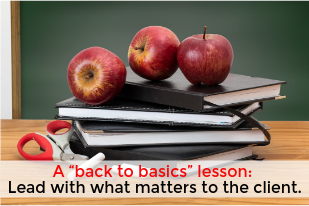 Sometimes the most important reminders are just plain fundamental ones that help us do the basics really well. This week, look for opportunities to “start with them” in your written communications, even if it’s just a few sentences. Then look for what you might codify in your own templates. 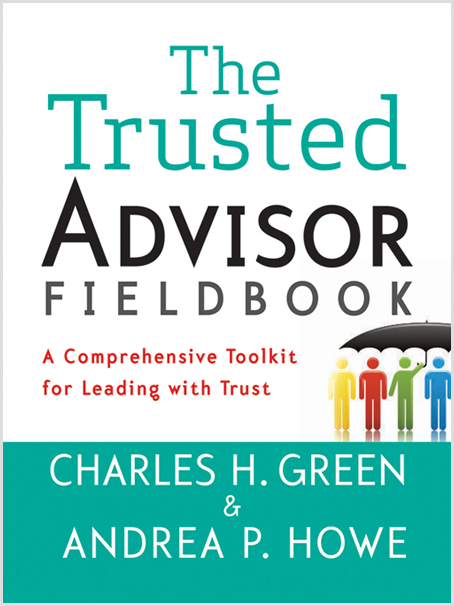 Speaking of proposals, consider writing your next one with your client, thanks to our friends at Trusted Advisor Associates, or brush up on ways to make your oral proposals more engaging in Chapter 13 of The Trusted Advisor Fieldbook.